The old Mr Stex lived in and for the gambling world (he had a betting office and it still works in this place). His son made the restaurant. If you have ordered, you can read witty old stories about Alfréd Stex at the tables. Since sports are a part of the gambling world, you can also watch major sport events on their projector. They have special fresh unpasteurised beer poured from an old-style tank and delicious food made by a good chef. It’s a great place for breakfast, dinner or lunch, or just to drink a beer or coffee. The interior and the furniture and the works of art shows us the world of the citizens and gentry from the past century. 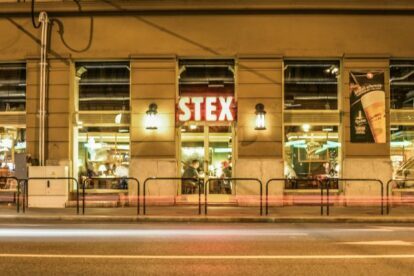 Stex is a calm, avuncular and comfortable place, so when I go out with my parents, we go there.